Be What is ABEC and how does Silverthin deliver precision? At Silverthin, we have the flexibility and capacity to customize products to meet your requirements with accuracy, value, and performance. Our standard catalog options are only the beginning of what we can provide for diverse applications. From standard bearings and high precision specials, to hybrid combinations of both precise and cost effective components, Silverthin is making the best solutions available to our customers every day. What ABEC grades are available? ABEC stands for Annular Bearing Engineering Committee. ABEC is part of the American Bearing Manufacturers Association, which acts as the official governing body of the bearing industry in the United States. 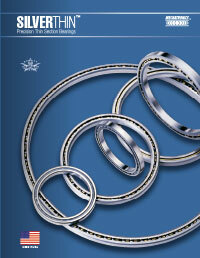 The bearing grades and tolerance specifications come in five classifications; 1, 3, 5, 7, and 9. As the ABEC grades increase the tolerances tighten from least to the most precise. The grades control tolerances from boundary dimensions such as bore “ The grades control tolerances from boundary dimensions such as bore and OD, to tolerances like axial run-out that impact rotating accuracy ” and OD, to tolerances like axial run-out that impact rotating accuracy, and values like the dimension measured from the center point of the raceway to the side faces of the bearing. ABEC level does not govern all aspects of bearing quality. There are many critical design features of bearings that are not covered by ABEC, including: material, cage, retainer type, surface finish (smoothness) of the rolling elements and raceways, clearance, preload, ball precision grade, or anything to do with the ancillary components like seals, snap rings and lubricants. ABEC also does not directly control noise level or torque. Why aren’t all bearings made to ABEC 9? As with most things in the manufacturing world, higher precision means higher cost, and the term “precision” is relative – one designer’s need for “precision” may actually require ABEC-7 or 9 bearings and another may be satisfied with an ABEC-1 bearing. There are also many cases where a problem with a bearing system cannot be solved simply by increasing the ABEC level. Deciding on a ABEC grade boils down to a cost / benefit decision for the designer. A bearing made to ABEC-5 tolerances will have tolerances that are approximately half those of an ABEC-1 bearing, but it could cost two or three times as much. Which ABEC grade should I design in? The ABEC grade specified for an application depends on the type of equipment and its function. A mechanical inspection system for a silicon platter may require a reader head located very close to the surface of the wafer. It is critical to control the movement of the inspection system in the horizontal axis, which has direct correlation to the axial run-out of the bearing in the system. A bearing of at least ABEC-5 grade would be required to provide the necessary precision in this application. A gun mount would require far less dimensional control or rotational accuracy. Preloading will impact the bearing’s performance far more as the bearing experiences heavy shock loads and external forces. Tolerances like axial run-out will have less impact on the accuracy of the system than the movements of the operator. Bearings in this application should be preloaded to increase system stiffness, but tolerances would be sufficient at an ABEC-1 level. To determine the best ABEC levels for your design, talk with a Silverthin Bearing engineer. A turntable is an application where higher rotating accuracy may not be critical, but the assembly steps of the unit are very important to the function of the system as a whole. Using an ABEC-5 bearing will result in consistent fit with the shaft, helping standardize the mounting forces and installation time for every assembly. A hybrid that has an ABEC-5 bore tolerance and ABEC-1 for all other tolerances will prove to be cost effective and meet the requirements of the application. Silverthin is able to provide a flexible solution producing a hybrid bearing that only has tighter control of the specifically required dimension at a much lower cost point. At Silverthin, we have the capability and flexibility to customize product to your requirements for accuracy, optimal value, and performance. Our standard catalog options are only the beginning of what we can provide for diverse solutions. 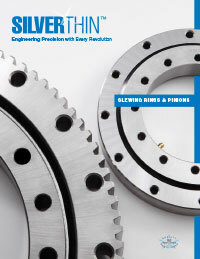 Contact Silverthin Sales about the requirements for your specific application.